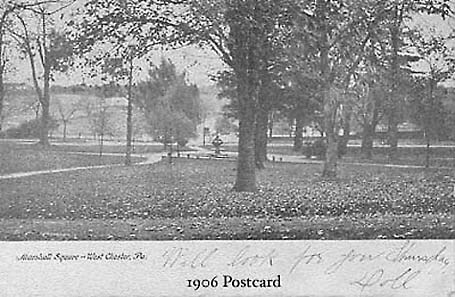 Picture postcard of Marshall Square Park, postmarked Nov. 6, 1906. Susan McGovern discovered the card in an antique sale and shared it with FMSP. 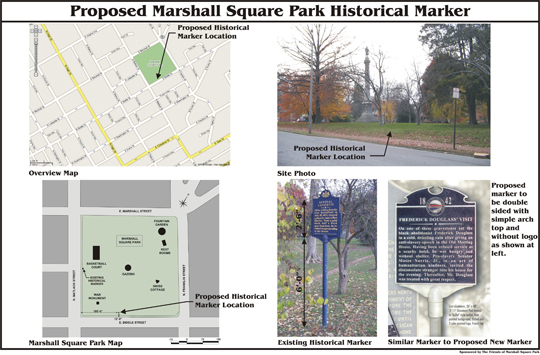 Marshall Square Park was modeled after Washington Square Park in Philadelphia. Botanizing was a favorite avocation of West Chester’s professional men, some of whom attained international recognition. Dr. William Darlington, Joshua Hoopes, and David Townsend were such botanizers, and they succeeded in having this square developed as a small arboretum; in 1878 it became a public park, based on a plan by Joshua Hoopes, a nurseryman. Although most of its large and exotic trees are gone, a few remain, and it is worth walking through the park to find them. The southwest corner originally held a basin for West Chester’s water supply; now it features the Soldiers’ Monument honoring the 97th Regiment of the Civil War. 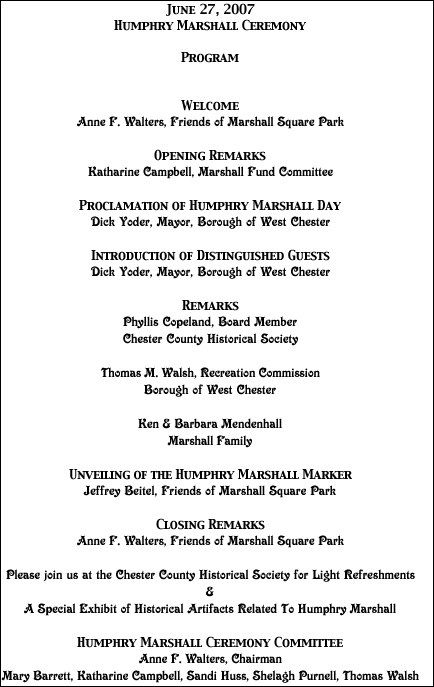 Its founders named the square after their 18th century predecessor, botanist Humphry Marshall. Marshall was born in 1722 and never went to school after the age of twelve; yet (appropriately for a cousin of William Bartram, America’s most celebrated explorer/botanist) he published in 1785 “Arbustum Americanum, the American Grove,” the first botanical essay in the Western hemisphere! 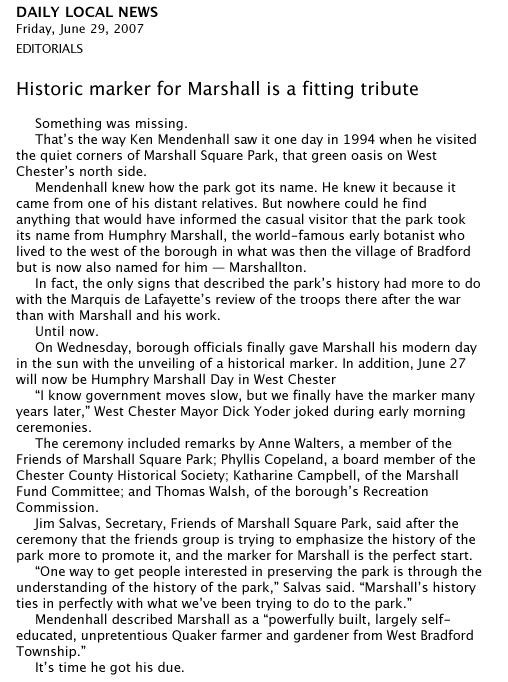 Marshallton, four miles to the west of West Chester, also bears his name, for he acquired the land on which that village stands. West Chester’s first public square, dedicated in 1848. 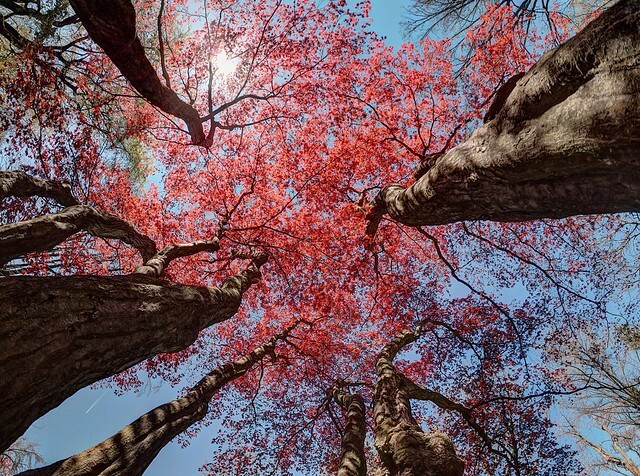 Recognized at the time for having one of the best collections of trees and shrubs with 160 distinct species. 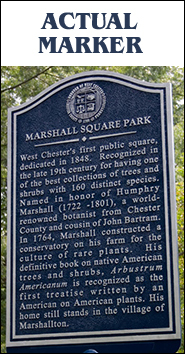 Named in honor of Humphry Marshall (1722 -1801), a world-renowned botanist from Chester County and cousin of John Bartram. In 1764, Marshall constructed a conservatory on his farm for the culture of rare plants. His definitive book on native American trees and shrubs, Arbustrum Americanum, is recognized as the first treatise written by an American on American plants. His home still stands in the village of Marshallton. Friends of Marshall Square Park surrounded the Park with hundreds of luminarias (PHOTOGRAPHS) in conjunction with the Borough’s Old Fashioned Christmas. FMSP set up the luminaria only for the first two or three years. Since then, Boy Scout Troop 14, who meet weekly at the United Methodist Church on High Street, get community-service credit for setting up around the Park. The Scouts also sell the luminaria throughtout the neighborhood at 2 for $1 and will even set them up for a small fee.